Courtyard by Marriott Times Square West welcomes guests to celebrate a Thanksgiving Day tradition in New York City with Courtyard. The Macy’s Thanksgiving Parade will celebrate its 90th year on Thursday, November 24th, 2016. Guests are welcome to enjoy this New York City tradition during this huge milestone. The parade will include balloons, floats, performers, marching bands, clowns, performance groups and the parade official. The parade will begin at 77th Street and Central Park West and then march all the way to Macy’s Herald Square location on 34th Street- that’s 2.5 miles of public viewing. Courtyard by Marriott Times Square West is a ten minute walk from the 34th Street and 6th Avenue point of the parade. For more information, please visit http://social.macys.com/parade/. Courtyard by Marriott Times Square West has contemporary, chic hotel rooms, perfect for tourists, business and leisure guests in New York City this summer. Each guestroom features free high-speed Internet, a mini refrigerator, an in-room safe, flat-screen HDTV and much more. On-site dining at the Bistro offers guests a casual environment with high quality, healthy menu options for breakfast and light evening fare to enjoy with a cocktail from the bar at daily happy hour. With a seasonal menu, the Bistro offers ever-changing options mixed in with old favorites, perfect for guests looking to expand their palate. Transportation is convenient with Penn Station, 34th Street- Hudson Yard Station, Amtrak and Port Authority Bus Terminal all within a quick five-minute walk from the hotel, making it ideal for all travelers and travel enthusiasts to get around New York City, year-round. Built from the ground up, the hotel offers 224 contemporary, stylish hotel rooms with a variety of amenities and guestroom types, accessible rooms available upon request. The hotel is a five-minute walk to Penn Station, 34th Street-Hudson Yard Station, Amtrak and Port Authority Bus Terminal, convenient for all travelers, in and outside of New York City. With friendly staff more than willing to assist with all needs, the Courtyard offers the best service for the best value. 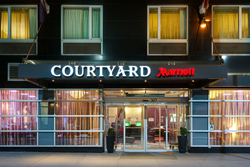 The Courtyard by Marriott Times Square West is managed by 365 Hospitality Management.